I know that I have been periodically ridiculed by various supervisors when I intervened in different situations in order to safe guard the patients under my care. One case in particular was during an influenza outbreak. The house physician had ordered every one of the elderly residents to be placed on an anti-viral medication. The medication didn’t arrive to the facility until shortly after 10:00 pm. By the time I had all of those prepackaged meds sorted for the 30 plus residents it was around 10:15 pm. I spoke with the charge nurse and we agreed that the medication should not be given that late because nearly all of the residents were asleep. In addition, many of these residents had already been given their HS sedation a couple of hours prior. One of the principal side effects with this antiviral medication was nausea and vomiting. Therefore, it was also a safety issue of not giving the antiviral medication at that time. There would be no way to safely monitor that many residents. I put on my report (my shift ended at 11:00 pm) what we had done and for the staff on days to get the time for this medication checked by the physician. The Assistant Director of Nursing had me in a disciplinary meeting several weeks later for not giving that medication that evening. I made it clear that it was discussed with the charge nurse and we had agreed that the administration time of that medication being so late was not appropriate. I was warned by both the Assistant Director of Nursing and someone from Human Resources that if that situation arose again, I was to give the medication. How many nurses have been bullied into doing a nursing task that they know full well could jeopardize the safety of their patients? I’ve been in situations where a call bell is ringing and when I went to answer it, I was told to stay where I was by a senior staff and told that one of the Personal Support Workers can answer it. If that call bell was a medical emergency and I didn’t answer it, what kind of trouble would I be in if that resident died and it could have been prevented? These two examples are only a small glimpse of what I’ve experienced in my 15 plus years of nursing. The point is that many Nurses are routinely placed in situations where they could potentially injure/kill someone. One of the key aspects of Nursing is Critical Thinking. Yet, if the Nurse is not allowed to use their Critical Thinking because of their particular work environment, how many of those patients are at risk? How many Nurses out there have been “ordered” to do various things that could potentially harm their patients? Many of those Nurses have done those things due to the high probability of being disciplined under insubordination, even though their Critical Thinking told them that it was wrong. This case has hit too close to home, but for the wrong reasons. Several years ago I badly injured my back and was put on various medications which created impairement. These were Percocett, Flexeril and Naproxen. In spite of this impairement issue, the Worker's Compensation Board (WCB) insisted that I be at work and they put in writing that I was to do light medication passes. I insisted that I was a nurse and that I am accountable to my governing body. They still insisted that I be at work. Eventually my employer pulled me off work because I was impaired and indicated that I was in a safety sensitive possition. Once the WCB got wind that I was off work, they went nuts and imediately deemed me as non compliant. They retaliated further by denying me more than two thirds of the treatments that I needed to recover. They deliberately sabotaged my recovery and my back continues to be messed up to this day with all of the treatment denials. Had I been at work in the condition that I was in, there's a high probability that I could have done various medication errors, potentially killing one or more of the elderly seniors under my care. About a year later when I was on even stronger medication, the employer's insurance provider started doing the same thing that the WCB did. During that period I was on numerous medications which included 1500mg of Valproic Acid per day. They were routinely dismissing my professional obligations as a nurse. They eventually deemed me as non compliant as well and stopped paying me. It has been over 7.5 years and the battles with the WCB continue and last year, after sending them mounds of medical documents, they continue to insist that I'm being non compliant. I have insisted that I will not intentionally commit an act that can potentially kill somebody. My heart definitely goes out to this nurse in the original post who has been charged, because that could easily have been me. When does the responsibility of a nurse start/end ? Yes, that response was from the regulatory body in my province here in Canada. Their response should raise concern because it opens the door to potenial abuse of nurses. 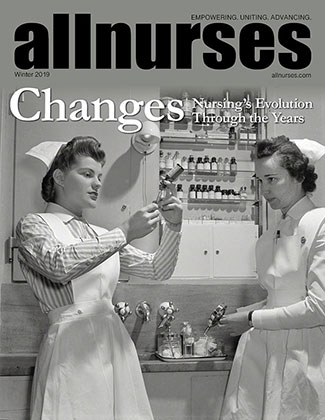 If the regulatory body is not defining when the responsibility of a nurses starts/ends, then it opens the door of many employers to really exploit nurses and giving them a proverbial license to say, "Regardless of when your shift technically ends, you will stay and do the following and you will not get paid." If that nurse does not have union representation, or has a pathetic union who does a really lousy job at representing nurses, (which happens far too often) this leads to actual slavery of nurses. Without indicating specifically the name of the regulatory body (for confidentiallity reasons), their statement was: Dear ........., thank you for contacting the .......... As outlined in the ................, Each nurse is accountable to the public and responsible for ensuring that her/his practice and conduct meets legislative requirements and the standards of the profession. The ......... does not state when this accountability begins and ends, as each nurse is accountable for their own practice. The situation you describe is a labour relations issue and should be brought to the attention of your union and management not the ............ Should you have any further questions relating to the ..........., please feel free to contact the ....... again. As I said, their response should raise concern for nurses as this type of statement may be applicable in other jurisdictions which can open the door wide open for the abuse of nurses by their respective employers. Thank you to all those who have responded thus far. I did get a response from my regulatory body this morning and they stated: The situation you describe is a labour relations issue and should be brought to the attention of your union and management not the College. Unfortunately I have brought many other issues to our union regarding the issues of nurses and I continue to hear the same thing. "This is not a wide spread issue because you're the only one bringing this forward." My response to this is usually the same, "That's because I stick up for my self and that the level of intimidation in the workplace is so high that few will ever come forward on anything." I stick up for my self because Nurses are not Slaves! I'm told that I have a meeting coming up in a few days with union and management regarding other alleged mistakes that I have done, including an alleged mistake that happened nearly three months ago! As I indicated to the union rep. "I'm actually supposed to remember the details of the said incident that happened three months ago?" I indicated to the union rep that this is becoming a witch hunt towards me on behalf of these nurse managers because I actually do stick up for my self and they don't like it. With regards to actually leaving at the end of the shift inspite of the fact that there were things that should've been completed, one RN was actually called at home and ordered to come back into work that evening to complete what ever it was that wasn't completed at the end of her shift and wasn't paid for it. She came in and was incredibly upset. To the best of my knowledge she did file a grievance with her union. As I have already indicated Nurses are not slaves! Unfortunately the best interests of the residents isn't a factor in our workplace. I could litteraly (without exageration) write a book on the countless examples that I've seen regarding that fact. I know I did describe some of these incidents to a fairly new nurse and she indicated that if I were to ever write that book, these situations are so extraordinary that most people wouldn't believe them and figure that these situations were actually fiction. I'm reminded of a comment that was told to me by an RN a few years ago who only worked a few shifts and then left. She left because of the environment being so toxic. She indicated, "management here don't want educated staff, they want pupets." So now I prepare myself for this interesting meeting that I have in a few days. I Just e-mailedmy regulatory body this scenario and question. Due to the nature of the question I felt that it would appropriate to share that e-mail here. Note: I haven't got a response back from them as of yet. Here's the email: A while back I was working a day shift where I work (a long term care facility). My shift was from 07:00 am till 15:00 pm. Near the end of the shift it was reported to me that one of the residents from my unit had fallen on her way to the entertainment in the main auditorium. The RN and I went down to do the initial assessment on this resident. This resident was able to walk back to the unit with me. Once back on the unit I did further assessments including a full vitals and completed the fall investigation report. Once everything was done, including giving a report to the nurse coming on for evening shift, it was approximately 15:30 hrs. I immediately submitted for 30 minutes overtime, because I felt that it was my responsibility to conclude the assessments, the paper work, computer charting and a report for the oncoming nurse. However, my employer decided that they were not going to pay me for that half hour that I stayed. Not only did I submit the correct overtime request form explaining the circumstances why I stayed for that 30 minutes, I also e-mailed the supervisor a few days later to confirm that she received everything to ensure that it was submitted before the end of the pay period. My supervisor even chose not to respond to my e-mail. Many of my fellow co-workers have had similar experiences with regards to staying after their shift has ended to complete what they felt was their responsibility to do so as a nurse, yet the employer has refused to pay them for the time spent outside their designated shift time. Therefore, this raises a serious question. For a nurse who works in a facility such as a Long Term Care facility, Hospital, etc., when does responsibility and accountability start and end for the nurse, if the employer will not pay for any time either at the beginning or end of the designated shift that the nurse is scheduled for? No appologies needed. I'm pleased to see that you show your staff plenty of respect. The nurse manager that I described before who did show respect for her staff, I would also call her a "coach" and a "cheerleader". She did an exellent job at coaching me and cheering me on with regards to taking extra courses when we were in the middle of doing training programs on violence prevention. Just as she retired I was in the middle of enrolling in a series of full length courses to get my full certificate in Forensic Studies. After 1 1/2 years I finally graduated with that certificate. Had she not been the type of manager that she was I would never had gone down that road. I hope that the level of respect that you show your staff is just as good, if not better. I welcome the wide range of responses to this post. I would like to mention a few things though. A) Nascar Nurse mentioned "I would think if this is the most "disrespectful" thing your boss does to you then you have a pretty great job." I wish that was true. Unfortunately I could write the proverbial book with the countless examples of disrespect, abusive conduct, etc. that my co-workers and I have experienced. This whole issue of respect does tie in to the bottom line of an organization. A few years ago we had a nurse manager who for the most part showed respect towards the staff. With that nurse manager we only had incidents of overtime during Outbreaks and the odd time during the summer months. With the nurse managers that we've had recently and currently, overtime has shot through the roof. One nurse for example made over $20,000.00 in overtime alone in one year. The reason for the overtime was that nurses were calling in sick like crazy because they were fed up with being treated like garbage. Therefore, if some of these health care organizations are looking at controlling their budgets and reducing costs, that's one place they can look. How are their staff treated? B) llg raised some good points like "I find that the ones who get most bent out of shape about such issues are usually either the ones with some professional insecurity or have credentials that they have earned only recently that they want to show off." Yet, I would suggest that my posts, including the one that I attached are read more carefully. The part that is disrespectful is that a person can write a letter or a memo to someone and include their professional credentials, yet they will not acknowledge the credentials of the person they are writing the letter or memo to. I've had several memos and letters sent to me by various managers over the years who didn't state their credentials, or mine. That's fine by me because I to like a casual work environment. However, I firmly believe that if anyone is to state their credentials, they show mutual respect by acknowledging the credentials of the individual they are addressing (if those credentials are known). C) I hope people are not just focussing on the issue of Professional Credentials. As indicated in the Canadian Study, the bigger issue is the lack of respect that nurses are getting. Allow me to put this another way: 1) How can an employer or nurse managers expect the best possible work performance from their staff, if they are not respecting their staff? 2) How can patients/residents or even family members expect the best possible level of care, if they are not willing to show respect to those who are providing the care? I'm sure others here could provide many other examples. The issue of credentials is but a tiny tip of a huge iceberg with regards to the ongoing level of disrespect of nurses. Respect goes along way. My appologies for creating any confusion. "Booking Off Work" is a term that is commonly used (in our community at least) with regards to calling in to your employer that you're not going in for a shift. Other wise known as "calling in sick". Personally I can relate to the thread that I attached, because of this whole issue of a lack of respect. When ever I have had to send a memo to one of my supervisors, I have always indicated their professional credentials beside their name. Yet, that same level of respect is never returned. I'll get a memo from a nurse supervisor where my name is referenced at the top (with no credentials) yet the supervisor will mention their professional credentials at the bottom. As I indicated in one meeting with a nurse manager and a union rep present, I stated that if managers want respect from their staff, it has to go both ways. Most Physicians (that I know of) will get bent out of shape if their professional credentials are not recognized. For example they expect you to address them as Dr. Yet, many of the same doctors will not show that same level of respect back. I think that's what the Canadian research was pointing to. The fact that nurses are calling in sick more because of the level of frustration that they are experiencing of not being respected. Recognition of professional credentials is part of it. Smart Nurse vs. Dumb Pharmacy, Round One. DING! I've experienced so many errors from our pharmacy over the years that it is literally impossible to count. Of course when ever we make a medication error we're immediately written up and face the wrath of some pretty pathetic nurse managers. I remember on one occasion I insisted that the nurse manager start holding pharmacy accountable for their countless mistakes, ranging from wrong dosages to wrong meds. This particular nurse manager actually did her job and got one of the most pathetic excuses from pharmacy I've ever heard. Pharmacy told her, "These mistakes are within statistical norm". Now I've been nursing for over 14 years. I wonder how my regulatory body would react if my excuse of accidently killing a resident/patient by giving the wrong medication was within statistical norm? I see this all the time where I work. Unfortunately many Nurse Managers will fuel this kind of environment. A former co-worker of mine said it best when she stated: "Management love it when staff are at each others throats, because that means staff are not directing their anger at management." At my workplace, like many others, the Nurse Managers office is like a revolving door with various nursing staff routinely going in to complain about other nursing staff. This is so easy to stop if both Nurse Managers & Union officials (if applicable) had the guts to stop it. Here's how it can be stopped. Nurse Managers and Union Officials (if applicable) need to state: "If a staff member has a complaint against another staff member, they are to properly submit that complaint in writing. If the complaint is not submitted in writing, then there's no complaint." Why does this work? First there's dual accountability. The person making the allegations can't go back on their statement by saying "I never said that". It reduces the ongoing game of the she said - she said syndrome. There's also accountability with management because management can no longer make these allegations up by saying something like: "We received a complaint that you were......" This notion of management making up allegations against various nursing staff happens all too frequently where I work. When a documented complaint is made, then the person who has the complaint made against them has the opportunity to read exactly what the allegations are in order to prepare a proper defense. Far too often, in my workplace staff will never know what the exact allegations are because Nurse Managers will often say, "I can't tell you who made the complaint", or "I can't go into the specifics of the complaint." Another reason why this works is that it raises the standard and credibility of these complaints. For example our governing body will not accept any complaint against any nurse from anyone (including a member of the public) in our jurisdiction, unless that complaint is properly documented. What do you look for in a Nurse Supervisor? One of the most important things that I look for is a Nurse Supervisor who is not a Bully and actually respects their staff. I worked with one nurse manager who was an exellent coach and a cheerleader to her staff. If it weren't for her I would never have taken all the extra courses that I did. Interestingly, when she was our DON, there was very little overtime paid out. On the flip side I've worked with some nurse managers who are completely incompetent, negligent, abusive and compulsive liars. Interestingly when these types of managers have been around, overtime costs have gone through the roof, because people don't think twice about booking off of work. I'm sure this subject has come up numerous times on this site, so my appologies for bringing it up again. A co-worker and I are taking a Physical Assessment course at the local College to upgrade our skills. We just finished writing our second test and she was very unhappy with her mark. Both she and I spent numerous hours over the weekend studying for this test. We had made up several overheads with sample quizes and other questions. She was really begining to know her material. In fact I tried tripping her on several of the questions, but she was able to figure them out. She was begining to know the material better than me. In addition, over the weekend I developed a very bad chest infection and had alot of difficulty concentrating on Monday when we wrote the test. My mark was 82% while her mark was 68%. Both she and I were shocked. I thought I had failed the test because of the negative effects of my cold (which turned out to be a slight pneumonia). While we thought she would have aced the test. The challenge here is that when ever it comes time for her to write a test she gets very nervous, her hands get very sweaty and she is unable to relax. Apparently she has a long history with this when it comes to taking tests. When we went over the test in our next class she was able to pick the right answers (multiple choice test) on nearly every question that she had gotten wrong. We have one more large test at the end of the course and I would like to see her do really well. I would welcome some valuable and any proven techniques that anyone is aware of that I could pass on to her to help her out with her test anxiety. Thanks. Forced to Engage in an illegeal Act! First this is a Thank You to all those who were very supportive with regards to what I had posted in this thread. Secondly I have gotten a response from our regulatory body as well as the government Ministry that I would like to share here. From the Regulatory Body: They indicated that they couldn't answer the questions of whether or not individuals other than a Registered Nurse could sign the Ministry form. For that information I would have to go directly to the Ministry them selves. From the Ministry: Thet sent me an email this morning and suggested that I read an attached letter that was allegedly sent to LTC facilities 4 years ago. In the letter it states, "The Ministry of Health and Long Term Care is confirming that any Registered or Licenced Health Professional with RAI-MDS 2.0 Coding and trainig may undertake the role of 'Assessment Co-Ordinator' for the purpose of signing Section R2b and VB1 of the Resident Assessment Instrument - Minimum Data Set 2.0." They go on to say, "An amendment to the Long-term Care Homes Program manual will be issued shortly." Unfortunately that was 4 years ago and we haven't seen any revised manual. The Ministry's email didn't answer the question of whether or not LTC facilities should change these forms to allow for any Regulated or Licensed Health Care Professional to sign in order to ensure the legal accuracy of the the form, while we wait for the new manual to be released. All I know is that I'll be keeping all of the correspondence that I got from the Ministry and our Regulator body, if in the event that I have to defend my self in a legal proceeding, as to why I signed a form that requires the signature of someone else.